There's about a week left in my current show in Belmar, which means I'm past all the hard work that was required. 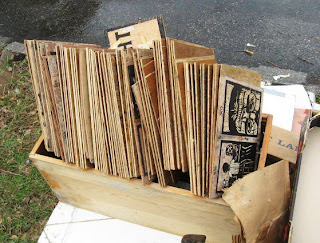 My woodcut class has now started- all veterans, so no need to order tools this time around, though I should do a paper inventory before supplies get low. And the spring semester is rolling along at the colleges. So it's time to get back to making art. It's been a couple of months since I last worked on a boardwalk print. The one in progress, the general daytime scene set in Asbury, has most of the buildings and structures worked out. Next phase will be adding the figures. Some will be based on photos and sketches I already have. I spent a little time this morning looking at some of these collected references, to remind myself of what I have and what I still need. I figure I'll find a model for any other ones I don't have references for, but it makes sense to combine poses for that one with the beach themed print in a single model session. I've given a little thought to that beach view composition, but haven't started sketching it yet. And then there's the Sandy themed print. Not expecting a lot of figures in that one, so it may be the easiest one to get done right now. 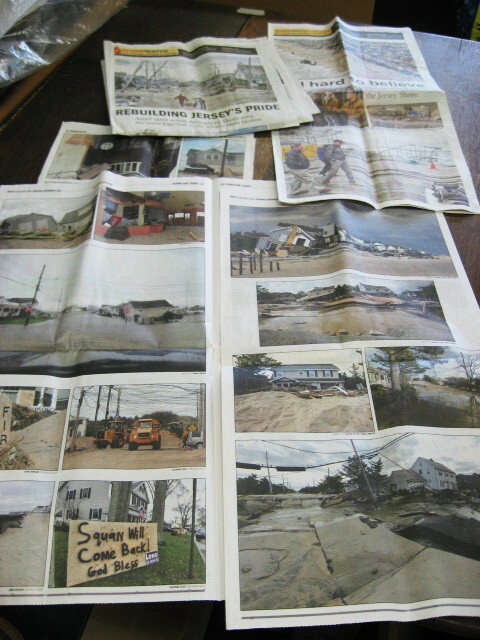 My parents get the paper every day, and not surprisingly, the local daily has a lot of stories about the local destruction we have been dealing with since last fall. My father has been setting aside an assortment of these photos, and I picked up his collection today before driving up to the Studio. Most of my visit was teaching related- using the good table space and light to finish grading some drawings I plan to return tomorrow, as well as shooting photos of those and some older work of mine. 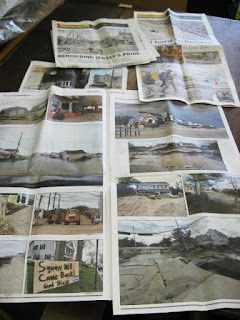 But I also took time to go through the pile of post-Sandy photos, just to put some images into my head. Most of the coverage was of destroyed homes, which makes sense as there are only several miles of boardwalks total on the state's whole Atlantic coast and houses filling every other bit of developed space. But any images of partially destroyed buildings are helpful, because when the time comes I'll be designing my own destroyed recreational architecture. In any case, I expect that at least one of these boardwalk prints will be advancing early next month. 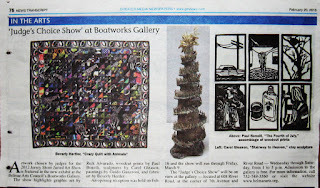 Things have been interesting around the Boatworks for months now. 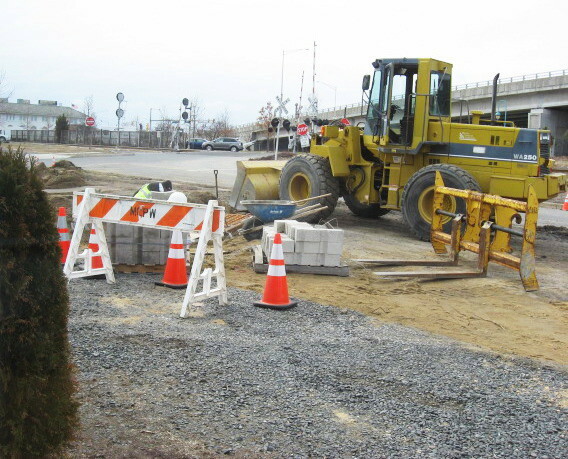 In October the town finally began the long planned repaving project on and around our street, but before it got too far Sandy came to town and put things on hold for months. Our property was filled with disaster aid trucks, and the town had plenty of other problems to deal with through the end of 2012. We fixed up our building in early January and things have been busy in the Boatworks ever since. Things have been busy outside, too, and what's found outside our building has changed from day to day. Installing the current show, and getting visitors into the gallery can be a challenge some days. and parking can be unpredictable. This morning was the first day of the new round of woodcut classes at the BAC, but as I approached the building I found myself wondering how close I could get. All over our parking area were heavy trucks (bulldozer, back hoe, dump truck, etc), and a bunch of guys working around and in a deep ditch cutting about 50 feet through our parking area. After studying the lay of the land from my car in the street, I found a route I could take to get my vehicle up to the front door. Eventually I found the one guy on the crew who could speak some English and he assured me my car would be safe in that spot for the duration of the class, but it was best to have the students park elsewhere. By then one had already found a spot in the municipal lot, and as the other pulled up by my car, I sent her to the side lot. I knew that I had the two, and had hoped that one or two more might show up to join on the first day (it's happened the last few times), but that ended up being the whole class. Other than the challenge of getting to the front door, things went smoothly. Both of today's students are taking it for the fourth time, and showed up with blocks they had cut on their own since the last class meeting in November. 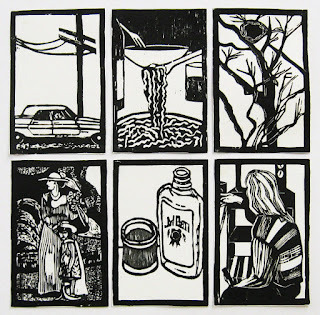 This was the first time I didn't have a single new participant, so I didn't have to spend any time going through the history of woodcuts, showing examples of prints, or demonstrating how to get started. Between my concerns about making sure everyone could find parking and get to the front door, and that they were ready to start as soon as they got to the table, I didn't get a chance to take out my camera and get any photos of the process or the resulting prints. Maybe next week, assuming we can get into the building to have the class. However I did have time later to take a photo of the above newspaper clipping, the article from last week. One of my students is from one of the far away part of the county where one of the papers is distributed, so she brought me a copy. Looks better in print than online, but most things do. Back in mid January we were in the process of putting together a post card to promote the show that is now on display in Belmar. The other four artists eventually sent an image of a single artwork. I felt that showing just one panel of my Fourth of July wouldn't give much of an impression of what the piece looks like on a wall, so I selected 6 favorite panels, put them together, and took the above photo. You won't see these particular prints in this exact order on the wall (these represent dates from September to May), but it carries the idea of a grid of individual images well enough. The cards were made (you can see it here) and we began to distribute them in the weeks before the show. Up until this week we hadn't gotten much publicity in the media. The local weekly that usually covers everything we do declined to give us even a blurb, much less run our full press release. However a newspaper group that publishes free weeklies around much of the county decided to give our show some notice. They had received via e-mail copies of all the images used on the card, the file names reflecting the artists. I received a call at home asking me to supply the titles of these works for use in the article, and it was needed in a couple of hours to meet the press deadline. As the person who put together the gallery handout I had a list of all the titles in the show, but not necessarily anything to say which image went with each title. Time to put on my detective hat. I knew my title of course. Three of the artists had sent me their work and I still had those files and e-mails. One put the title in her file name. Another included it in his e-mail. The third didn't provide titles, but when in the gallery I noted the title of the piece that ended up on the card. The fourth artist had sent his image straight to the postcard designer. I had his written list of 6 titles, but no other information. I had a photo of his 6 works on the wall, and I did know the titles of two of the works. Those two titles on the list corresponded to the order those pieces were on the wall. Hoping that his whole list worked that way, I took the title that would correspond to the image in question, added it to the others, and sent it in on time. And when I was able to get into the gallery a couple of days later, I learned that I had guessed right. This media group publishes papers through all of Monmouth county... except the corner of the county which includes Belmar and the homes of most of our members. I got a call from one former co-worker who said she was able to get one, and we got the word out to our members to find copies, so we'll eventually have it for our files, and then I'll post a photo of the printed version here. Meanwhile, it is available online, at least for the moment. 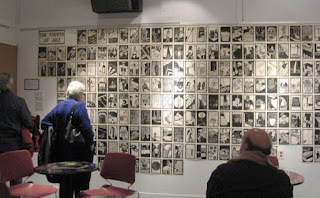 It turns out to be a very short story, and only 3 of the artist works are shown, but one is mine, and if it brings a few new visitors to the gallery, it will be worth it. I'm excited to get going on my next project, and even spent some time today looking through my gathered reference material. But before I can get into that I have a whole lot of other art related stuff to deal with, and I addressed a bunch of them today. Still lots of confusion at my university with paperwork related to the current classes. Did my syllabi weeks ago, but maybe not everyone has it yet. Computers do make this kind of thing much faster than my days of typing everything with my old modern electric typewriter. (I don't know if the typewriter was still working, but after being down in the sewage in the basement last fall, it had to go) And I learned how to save documents as pdf files, which could be useful in the future. Maybe that's done now. Next stop, a local home center to get some class supplies. Final numbers on my woodcut class won't be known until the first meeting, but I have some paid students, which means it will run. I have enough ink, paper, and tools to get us started, but I'm low on wood, and the wood filler I had from last year mostly dried out, so I invested in a new pail. Carrying my plywood through the breezy parking lot took a little concentration, but based on my schedule and expected weather, today was the best day to get this necessary task done. From there I drove to the Studio, to drop those items off. But while I was there I finally took care of another thing I needed to do, now that my Fourth of July piece is up on the wall. Like my old typewriter, a good portion of the Fourth of July blocks were underwater in that flood, and had to go to the dump. The surviving blocks were boxed up and moved to the Studio. So far no one has inquired about buying any of the prints in the show, but it could happen in the coming weeks, so I figured it would be best to have a list of which blocks still exist. So I pulled them all out and used my big table to put them in order and catalog them. 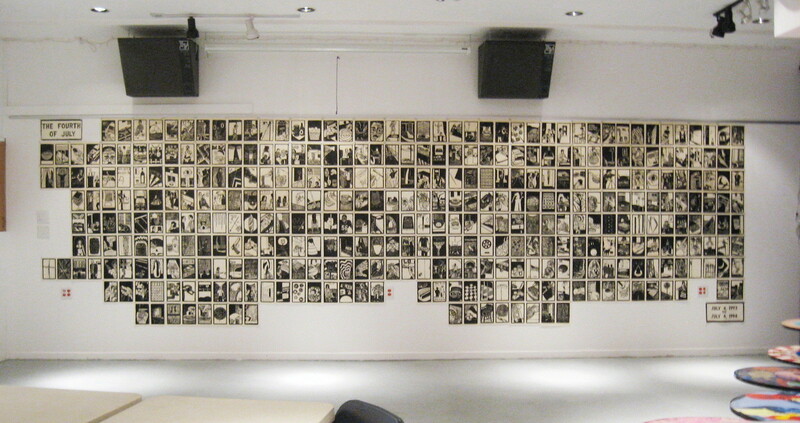 It turns out that I have 102 of the diptych blocks out of the 183 that had been cut and printed. Because of the way they had been packed in the basement, the missing days are scattered throughout the year. I repacked them in chronological order to make it easier to find specific dates in the future. After that, with the sun setting and the temperatures dropping, a few more non-art related errands and I was home. I had more stuff to do after dinner as well, but nothing worth writing about here. It's been a long road getting ready for this show. I'm not talking about the prints in my piece, cut and printed 19 years ago, but about the process of organizing the show. I did a count last night and found one of my inboxes had 72 e-mails over the past 5 weeks dealing with aspects of this show. Didn't do a count on outgoing, but probably at least two dozen. We got the postcards done, brought the work in to the gallery on schedule and got it on the walls, a long process in my case. I produced a press release and a gallery handout with the list of works. I endured snowstorms and threats of snowstorms. I volunteered some loaves of homemade focaccia as part of my food contribution, which meant shopping for ingredients this past week and four hours today of dough mixing, rising, shaping, and baking. But it all got done. I got to the gallery today about 20 minutes before it was to begin, with an armful of bread. At the official start time, 4 of the 5 artists were there (the fifth never showed), and some of the people in charge of the BAC, but no visitors. However people started walking in the door a few minutes later, one or two at a time, and before long we had a crowd. Above, a few people looking at some digital abstracts in the front room. 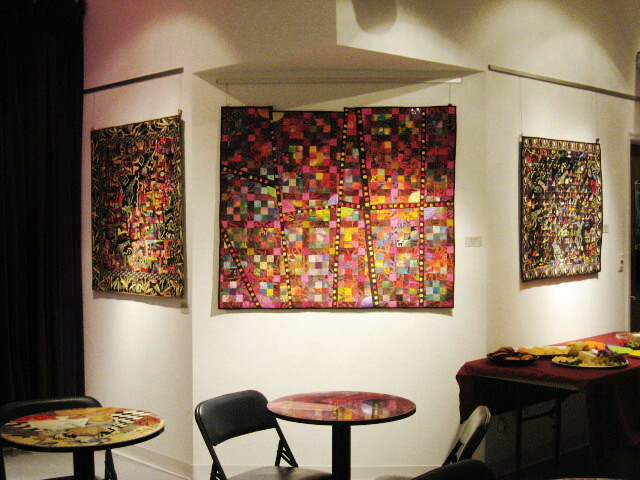 Below, my back room space was shared by Beverly Hertler's quilt based fiber art, both of us featuring grid structures. Photos of some of the other art can be seen here. At most BAC shows a crowd tends to gather in the back, between that being where the food and the cafe tables are. Those people had my piece to look at. I was asked a lot of questions about individual panels, but I know the stories very well, so I can always explain them. Despite the threats of snow, we ended up with a pretty good crowd, several dozen passing through over the two hours. We even had a few of our critique group regulars- Molly and Katie. The show will remain up through March 8th, then make way for the next big juried show. It will come down a lot faster than it went up. And maybe I can get started on some new art. Been a lot of preparations for this, but today was finally the day to install the Fourth of July. This is the fourth exhibition of the whole set, not including its residence in my Carbondale studio as I was making it. There are two complete copies of the series- first proofs printed as diptychs (just like the blocks themselves), and a better printed set in which each panel was trimmed to the borders. The latter set was used in the first two exhibitions, each time the prints were mounted to a hard backing that was then put on the wall. At University of Illinois I had it attached with tape hinges to foamcore panels, so I could attach those with adhesive to a large brick wall. When I arrived at the site and found the brick wall had a number of protruding outlets, power strips, and thermostat boxes (the U of I organizer didn't notice these until I showed up), but I solved the problem by cutting donut holes in my foamcore pieces to fit around the obstacles. 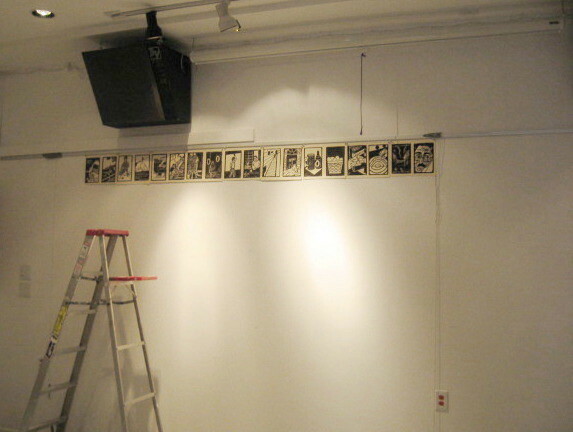 The second show was my MFA show, for which I mounted them on painted lauan plywood panels, bolted together and hung on the wall as a single unit. Those prints remained on the panels until last year, when I salvaged them as part of cleaning out my parents' basement. The third exhibition was put together on short notice for one of the galleries at Kean Univeristy, and I just tacked the first proof prints to the wall. Looked pretty good. I considered both sets of prints when preparing for this show, and decided to go with the option of the first proofs and the push pins. I had made various measurements of my destination wall since our first meeting about this show. It's a big wall, but also having some obstacles to work around. I spent a lot of time trying to work out in advance possible configurations for prints, but the dimensions I had to work with did not allow for an even rectangle layout. That's okay- the piece is modular and variable and I've gotten used to arranging it around stuff on the walls. My upper limit would be an aluminum rail permanently attached to the wall (a track holds an adjustable wire hanging system used to hold framed works), which cut off some potential wall space, but gave me a perfectly level edge to work with. There would be three sets of electrical outlets within my planned layout, and to make sure of where they would work within my grid, I started by hanging three plumb lines from the rail down to the edges of the outlet covers. That way the grid that I'd be starting at the top would line up properly when it reached the outlets five feet below. The photo up top shows the beginning of the hanging process. Getting the top row in place took a whole hour. Part of that was climbing up and down the ladder constantly, and part of that was that there are a lot of irregularities in the blocks over the first month of the series. When I started the series I wasn't thinking about displaying the diptychs, so spacing between the panels wasn't completely uniform, and top and bottom margins also varied. 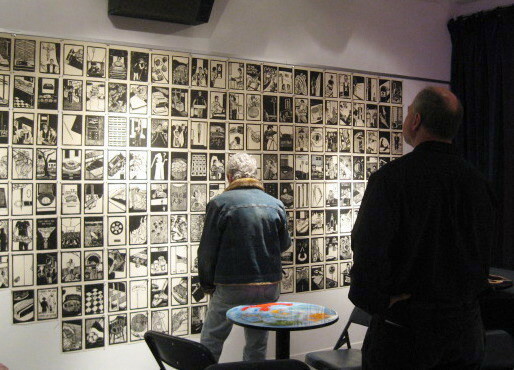 I checked each diptych for level, and then used a longer board to verify level along 3 or 4 diptychs. The bottom edges of that first row had the same issues, so lining up the second row had similar complications. I used the ladder for the third row as well; I could have reached it from the ground, but it made it easier to check that the panels and rows were level. After that I could pin them up standing on the floor, and I could finish the rows in 15 to 20 minutes each. All together it took about 5 hours to get the whole set up on the wall. 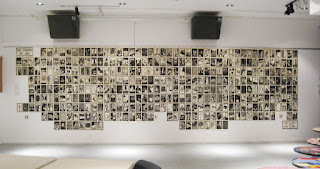 I hung around a little while after, moving tables and chairs out of the way so I could get a photo of the whole wall. (I didn't have a good digital photo of the whole piece before, so this alone almost makes the effort worthwhile) Click on the photo below to enlarge. To give an idea of scale, it's about 23" wide and 7' tall. While I was getting my piece on the wall, the rest of the show was coming together. So at the end of the day all five artists had installed their work. A few minor adjustments to be made, but the big work in getting the show ready is done a few days ahead of the opening. I'll post photos of the rest of the show on the night of the reception, but I can tell you that the whole show looks good. 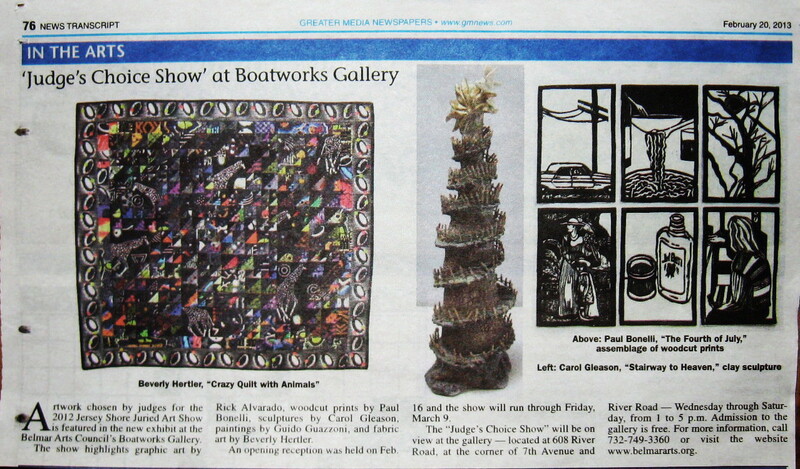 The JAS8 Judge's Choice exhibition's opening reception is Saturday, February 16, from 5 to 7 pm at the Boatworks. 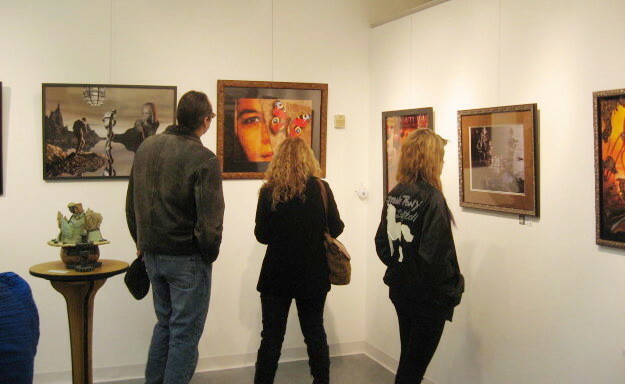 It's located at 608 River Road in Belmar (where 7th Ave crosses the railroad tracks) and admission is free. More than a third of the way into February, and still not a whole lot of art getting done. But I'm almost past the process of getting a big show up and open, and after that I'll have more of my time back. It seems like I have received or sent about 40 e-mails over the last week that were about the upcoming Judge's Choice show in Belmar. Even minor details like figuring out who is bringing what food and drink to the reception takes a lot of time. 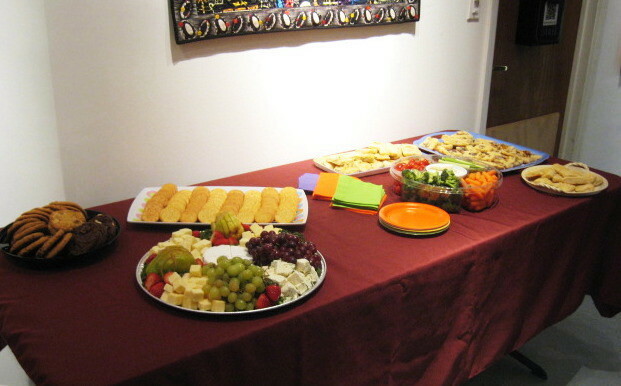 I don't recall volunteering for it, but somehow I ended up as chair of the show, so I have had to coordinate not just the food, but the postcards, the press release, the installation of the show, wall labels, and handouts. (some stuff I did myself, some was me chasing after people to get stuff done, and some was just keeping track of what everyone was doing) And then there's the efforts to get ready for my part of the show. The last major task was to track down enough steel/aluminum push pins to attach all the Fourth of July prints to the wall. (no one around here seems to sell them, but I uncovered a fourth box today in my printmaking cabinet in the Studio, which should be enough) Tonight I worked on various alternative layout plans for hanging the prints on my assigned wall, working around all the items that are permanently attached to that wall. (I've dealt with this kind of obstacle two of the other three times I have displayed this piece) I'll just take a few last measurements there tomorrow morning, and then get it all up on the wall by the end of the day. After that, it's just doing my shopping for the reception. But I took a break from all that for Mardi Gras. 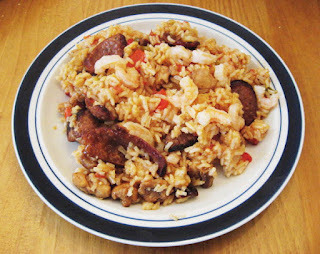 As I've stated many time before, here at Studio Arrabbiata we celebrate all things spicy, and that means I always make a big pot of jambalaya. Actually I made it on Sunday this year, and have been eating the leftovers for the past two days. It's one of those dishes that can be better the next day; even the photo above is a leftover from last year's feast. So tonight I finished it off, along with a cold beer and some favorite New Orleans based music in the background. Back to work tomorrow. Tonight something happened that hasn't happened for at least a few years- we held the critique on a different night of the week. When we first started this over 5 years ago, we met on Wednesdays, but Molly had a schedule change that caused us to move it to Mondays. But due to various conflicts, this week it was decided to move it to Thursday evening. At least for this month- could be different in March. Perhaps because of the change we had a smaller crowd than usual (not to mention that 3 of our longtime regulars will not be available on any day for quite a while), but we still had a lovely evening. The change did throw me off a little, with one result being that I forget to grab my camera, so no photos from tonight. 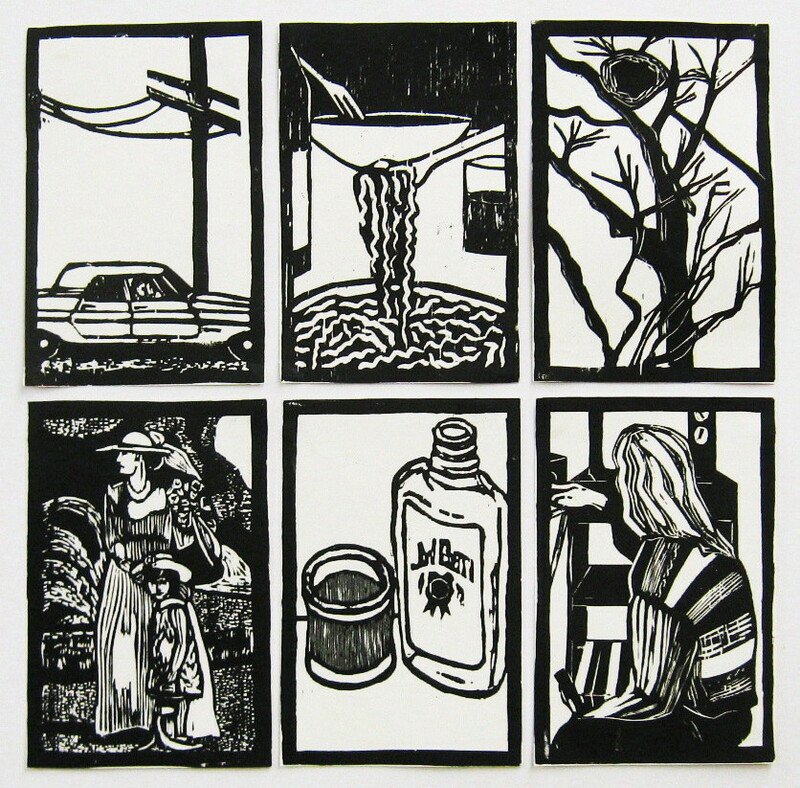 We opened with Mary (from my woodcut class), who brought in a linoleum block in progress, an outdoor scene with come complex details. (if she ends up taking my class again, I'll see her piece again before the next crit) Katie brought a small painting on panel, with beautiful colors and only a little bit disturbing to some. Tim had another large mixed media drawing, images with lots of words filling the negative spaces. Adam had a piece built around a found object, while Vince showed us the results of a conceptual photo project begun last year. Molly showed us a rubbing of a woodcut block in progress. I still don't have anything to show, so I went with handing out postcards for my new show.